Children are gleeful when they see animals ! – villagers too are happy visiting Zoos, may not be the same with city man. The sprawling Vandalur attracts many visitors – and many were disappointed as it remained closed during Pongal, having not recovered from the devastation of Cyclone Vardah. According to zoo officials, more than 15,000 trees had been uprooted in the cyclone; there were other damages too, to pipelines supplying water to the moat area, electric poles and the like.. .. .. .. during Chennai floods, there were rumours that wild animals had escaped, roaming free and could harm humans !! Old timers would recall that the Zoo once stood at Moore Market complex and towards the end – animals looked sickly in small cages. The shift to Vandalur though criticised those days as moving far out of the city was a good move, at least for the animals as they had bigger greener environment and bigger space ! The Eifel, is a low mountain range in western Germany and eastern Belgium. Many parts of Germany experienced rains as record floods engulfed the historic eastern German city of Dresden, swamping its Baroque architecture and driving thousands from their homes. A tide of debris-laden brown water also submerged other towns on the River Elbe, forcing the evacuation of tens of thousands while volunteers battled to save the centre of Dresden, the capital of Saxony, 120 miles south of Berlin. 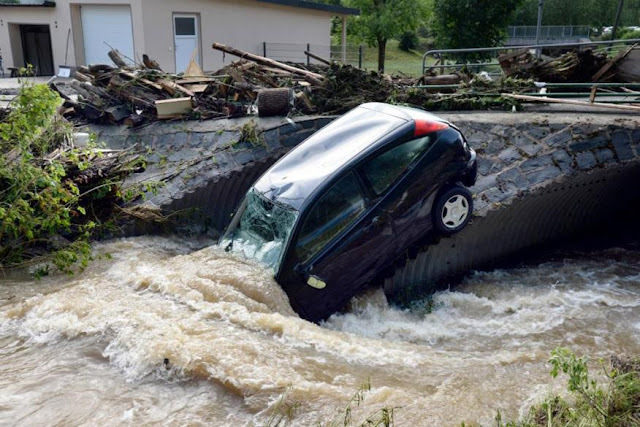 Floods have killed at least 89 people in Germany, Russia, Austria and the Czech Republic over the last week, after torrential rains sent a huge surge of water through river systems. At least 10 died in Saxony. In Germany, the surging waters continued to rise. Officials feared more of the architectural gems of Dresden would be submerged. The Elbe rose from a normal summer level of about two metres to 9.16 metres, well surpassing the 8.77 metre record of 1845. The last four bridges open in Dresden were closed. Some experts were predicting the Elbe would peak at about 9.6 metres early on Saturday. Chennaites, know the aftermath of flooding too well !!. Its web calls itself a Private company and is owned by the Wallpott family. The Cologne merchant, Hans Wallpott acquired in 1965, parts of grounds, which were formerly used for fish farming. Through his love of nature and the newly gained space, he soon kept dogs, donkeys and a wild boar. He built enclosures, opened paths and afforested the hitherto bare property. In 1972, President Konrad Schubach and other public figures opened the zoo's large forged iron gate. For Hans Wallpott fulfilled a lifelong dream with his success in turning the scenic side valley into a unique attraction. A new zoo had been born. That zoo is in news as five dangerous predators, including two lions, two tigers and a jaguar escaped from the zoo in western Germany. Though all of them were captured back, a runaway bear, however, had to be shot dead by authorities. A drone was used to track down the animals and residents were warned to stay indoors, in the town of Lunebach. The five big cats were safely tranquilised and brought back to their cages in Eifel Zoo today after a huge operation to hunt them down. The animals were able to escape after flooding from an overnight storm that caused a river to burst its banks damaged their enclosures. A video posted to social media showed floodwaters turning streets near the zoo into raging torrents of muddy water that levelled fences. The animals were thought to still be in the zoo's ground, but residents in the area, near the Luxembourg border, were advised to stay indoors during the hunt. Numerous police, zookeepers, and firefighters combed the zoo looking for the animals before they wandered into the town and manged to find them all. Eifel Zoo has almost 400 animals of 60 exotic and native species, including lions, tigers, and other big cats on its 30-acre site that gets 70,000 visitors a year. There have been some incidents of animals getting out of their enclosures, drawing criticism. Today’s break-out sparked a massive hunt, and a bear, which also broke out of the Eifel Zoo in Luenebach, was shot. 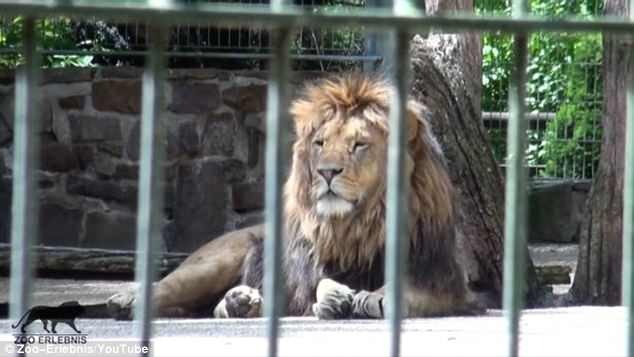 The escape comes two years after another similar case in eastern Germany, when two lions broke out of their cages at the Leipzig zoo. One of the lions was shot dead while the other was eventually brought back into captivity.